You are here: Jake's Bones > My 400th post - and hello Netherlands ! My 400th post - and hello Netherlands ! I'm in the middle of exams at the moment, so you may have noticed that my posts recently have been shorter than normal. But since this is my 400th blog post (really !) it seemed like the perfect time to share some good news: there's now a Dutch-language edition of my book ! They've made some changes to the cover (bye bye T-rex !) 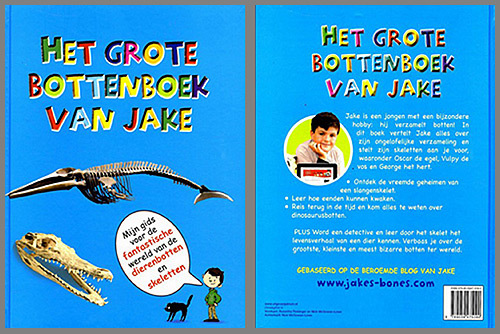 and changed the title to "Het Grote Bottennoek Van Jake" (which means "Jake's Big Book of Bones"), but otherwise it's the same great book. It's also the fourth foreign edition after the UK version, the USA version (which has my photo on the cover) and the Korean edition. Next weekend is also going to be very exciting for me: I'm travelling down to the Eden Project in Cornwall for the awards ceremony for the Royal Society Young Person's Book Award. There are six books on the shortlist, and judging has been by childrens' groups all over the UK. Fingers crossed - and I'll post here what the result it as soon as I can (probably on the Monday evening of the 16th). The best camouflaged animal ever ?